ALEXANDRIA, IN- James J. “Jim” Flecker, 90. Passed away at his residence on Wednesday, January 23, 2019 following an extended illness. Jim was born on November 15, 1928 in Alexandria to Kenneth and Stella (Lamerton) Flecker and has lived here all of his lifetime. As a young man, he worked as a meat cutter for the Hoosier Market and then later the Kroger Company. He served his country during the Korean War in the United States Army. He retired from Delco-Remy plant 8 in 1981 after 30 years of employment. For many years, Jim worked as a funeral assistant for Noffze Funeral Homes and Owens Funeral Home. 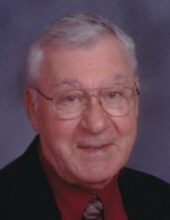 Jim was a lifelong member of Saint Mary’s Catholic Church in Alexandria. He belonged to the Knights of Columbus where he held the 4th degree, the Alexandria Eagles #1771 and the former Alexandria VFW. Jim enjoyed life, fishing, golfing, time spent in Florida and he was especially fond and proud of his grandchildren. A Mass of Christian Burial will take place at 11 am on Saturday, January 26, 2019 at St. Mary’s Catholic Church, 802 West Madison Street, Alexandria with Father Dan Duff as Celebrant. Military honors given by the United States Army and the Elwood VFW Honors team will follow the Mass. Cremation will then take place with private interment services in Park View Cemetery, Alexandria at a later date. Friends may call at the Owens Funeral Home in Alexandria on Friday from 4 pm to 6:45 pm. A Rosary Service will take place at 6:45 pm in the funeral home to close the visitation hours. Memorial contributions are suggested to St. Mary’s Catholic Church in Alexandria with envelopes available at the funeral home. To send flowers or a remembrance gift to the family of James J. "Jim" Flecker, please visit our Tribute Store. A Rosary Service will take place at 6:45 pm in the funeral home to close the visitation hours. "Email Address" would like to share the life celebration of James J. "Jim" Flecker. Click on the "link" to go to share a favorite memory or leave a condolence message for the family.